Thanks for the links man! I like those renthal street bars. That may be what I go with.... Those big bore risers are a little cost prohibitive. 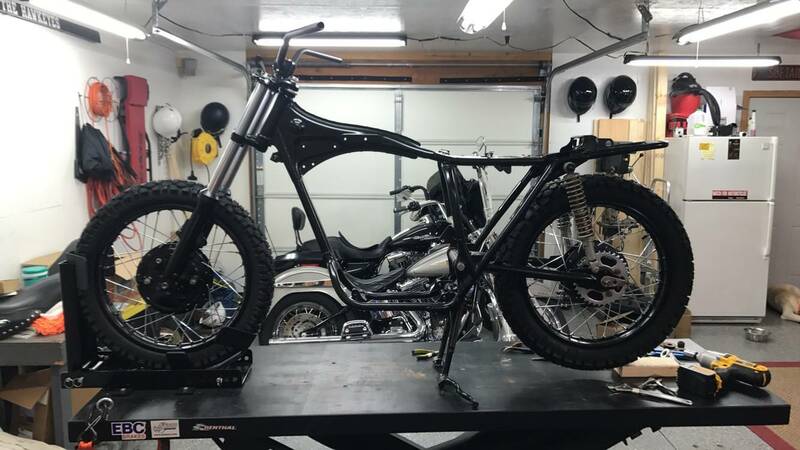 Got the rear wheel almost all laced up. 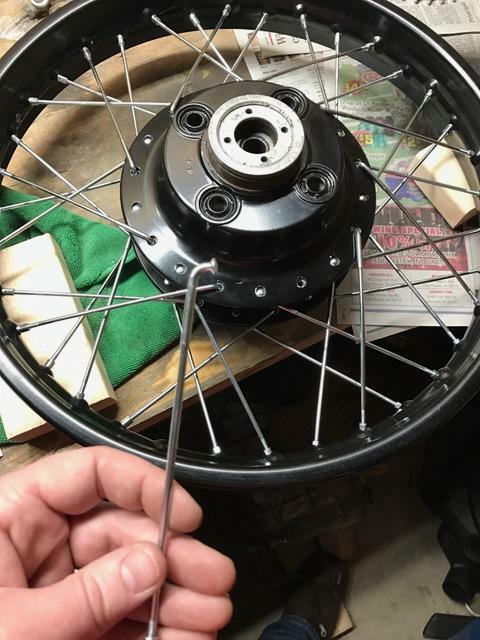 The spokes I ordered from 4into1 had one extra inner spoke, and one to few outer spoke. I got the wheel almost all laced up, thought I had accidentally used an outer as an inner, so I took it all apart, resorted the spokes, and put it all back together only to see that I was still off. I should have counted the individual spokes to make sure there were 18 of each. I'm sending a message to 4into1 tonight and hopefully they will make it right. I ordered the spokes a few months ago so we will see. I'm really hoping I wont have to take it all apart again. Edit: 4into1 took care of the issue and is sending me the spare spoke today. Gotta love good customer service. So after about a 9 month hiatus this project is back on track. Wife and I bought a new house and did some remodeling to it, then hunting season came along, and basically I haven't had much time to work on it. The good news is that the new house has a 24x24 detached shop that is heated and everything so I'm happy with that. 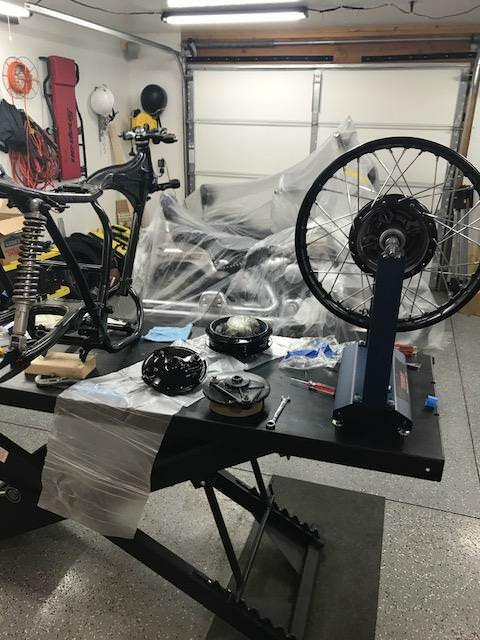 I just installed the new all balls neck bearings, installed my freshly powdercoated trees, finished truing the rear wheel, and have painted the front hub and laced the front wheel up for the most part. For whatever reason this rim is fighting me pretty hard so I have taken a day break and will go back at it tonight. I just got my fork lowers back from powder coat as well so I will be reassembling the front end over the new days. I'll get some pictures up when I can. Update. We have roller and it looks like a motorcycle again. Almost. 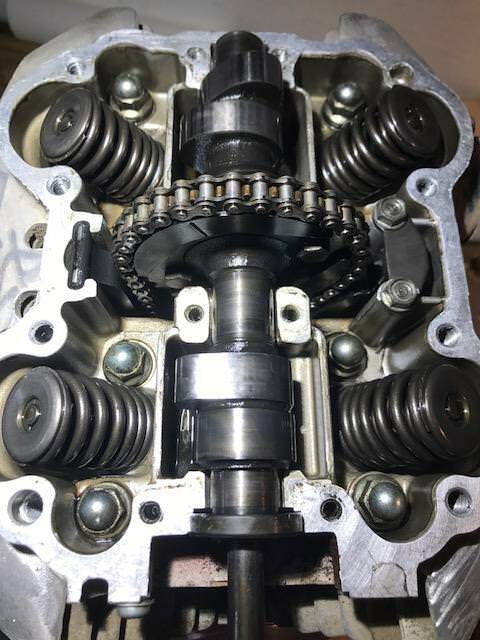 I broke into the top end of the engine because I figured I would inspect the cam journals before I put the motor back in the bike. The valve cover looks good, and the cam it's self looks pretty good. Is there a good write up anywhere on how to pull the cam to inspect the journals in the head? 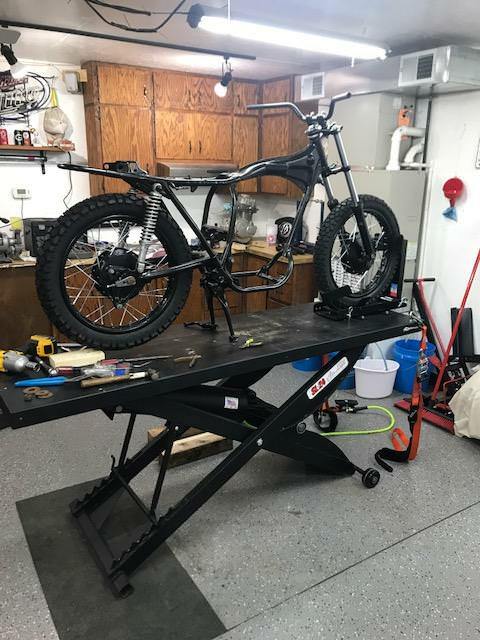 I did some searching and I assume the biggest thing is marking where it is currently and keeping the chain tight so it doesn't fall off the crank. Any other input before I pull it out? I would like to do it as simply as possibly. Here's a few pictures from the last month or so as I started to pick up steam on this project again. I had to order a new rear axle and got that installed last night. 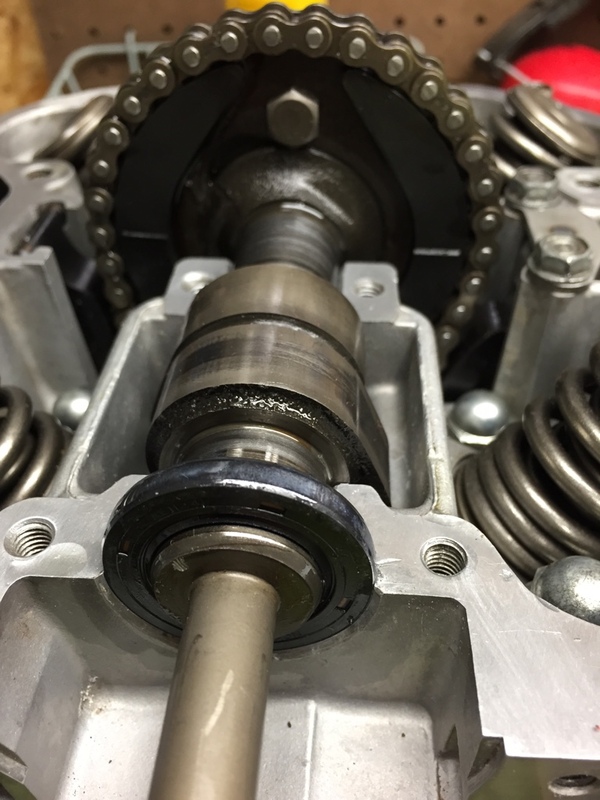 (somewhere in the past someone stripped the threads on it and rethreaded it for a different nut partially, and used a bunch of washers to take up the rest of the slack. Rockers and journals look really good. I wouldn't even bother pulling the cam out unless you want to learn how to do it. If so, the shop manual gives you the breakdown procedure. Its quite simple, you need to unbolt the sprocket to get the cam chain off and pull the cam out. Be sure to stuff a rag down the cam chain hole so you don't lose the bolts. I use a coat hanger or piece of steel wire to tie around the cam chain to hang it. Mostly, what you need to worry about is the cam alignment when reassembling, which is also detailed in the manual. I have a good pic of everything lined up in my thread i'll try to dig up. 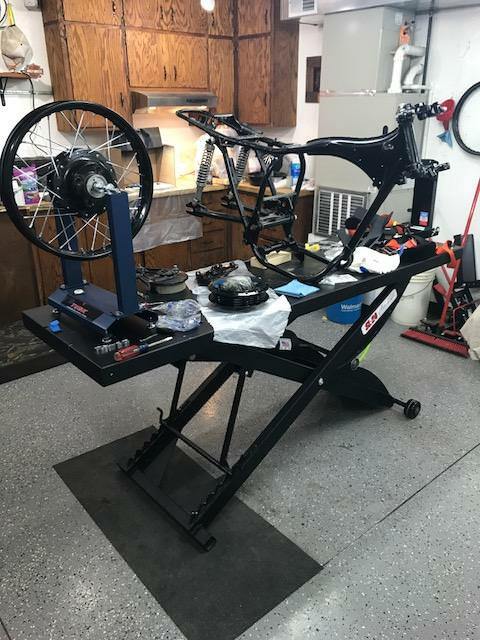 Basically, with the rotor at LT on the #1 cylinder (sitting on the bike, the left) you need to make sure the marks on the sprocket are aligned with the case, perfectly horizontal. Thanks for the input ADV. I wasn't sure if just looking at the journals in the valve cover and the bearings would be indicative of the condition of the journals in the head. I probably won't putt it apart then. I think this motor has been pulled apart before. The acorn looking nuts in the head definitely have some marks on them from where they have been wrenched on. I guess I'm not sure if that would have been done for the recall or not. The motor has both punch marks on the vin. 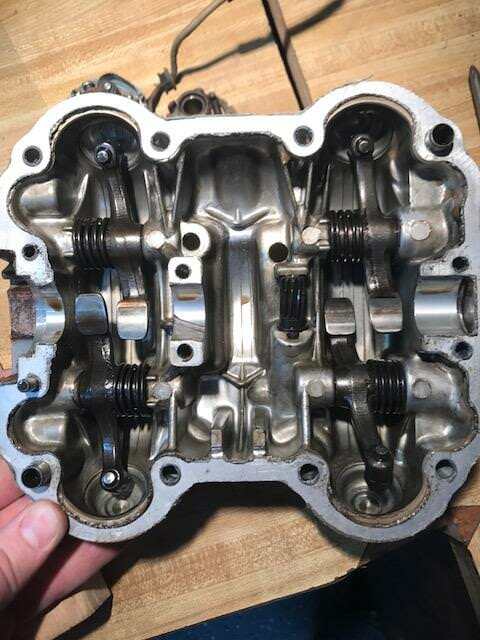 Is Three Bond or Hondabond the right stuff for the valve cover going back on? Its all basically the same stuff. I've used Hondabond and Yamabond before with good results. Clean the metal with alcohol or acetone. I spread it on very thin with a finger (wearing gloves of course). You want to go as thin as possible while still getting full coverage. For rocker covers I'll generally spread the sealant on the head-side, and then use one or two bolts as a guide to drop the cover on. There's locating pins, so you don't need bolts to guide the cover.